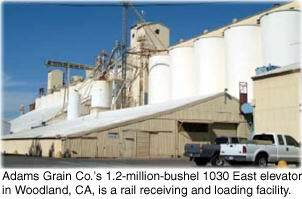 Adams Grain Co., Arbuckle, CA (530-476-2000), occupies a unique niche in California’s Sacramento Valley. Adams Grain currently has GMS 4000 workstations installed at five of its eight California locations – two grain elevators in Woodland and one each in Dixon, Goshen, and Famoso. 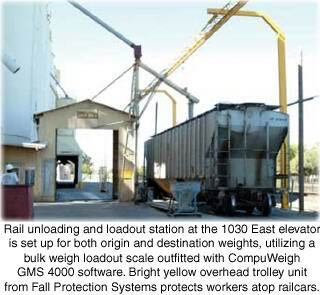 As an example of how the system works, the weighmaster at Adams Grain’s Road 102 elevator at the east end of Woodland, operates two truck scales from one CompuWeigh workstation but can forward data to any of the workstations at the five GMS locations or to Adams Grain’s accounting system at their headquarters in Arbuckle. 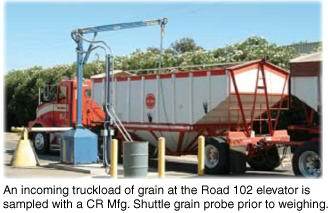 A truck delivering a load of grain to the Road 102 elevator first proceeds to a probe station, where a sample is taken by a CR Mfg. Shuttle grain probe and pneumatically transferred to an on-site grading laboratory. The truck then proceeds to the facility’s truck scale. The weighmaster enters the truck’s identification number and the commodity it is carrying into the GMS Truck system. The software records the weight of the truck and its load. Meanwhile, the grain grader inputs the official grade and other relevant factors into the system. The weighmaster can send the truck to one of several receiving pits at Road 102 and routes the grain to a specific storage bin or to a large flat storage building, or alternatively, can send the truck to another Adams Grain elevator. Since all of the GMS workstations are linked via a Wide-Area Network, data can be forwarded to any other workstation. In addition, every five minutes, the GMS system automatically downloads all new data to the company’s grain accounting system for tracking and settlement. After unloading, the truck returns to the scale, where the tare weight is recorded, and that data also enters the GMS system. Adams Grain operates a password-protected web site where growers can look up their unloads for the day and track weights and grades by field. This web site also is updated automatically with data from the GMS system. GMS also tracks outbound grain shipments. At the Road 102 elevator, which ships grain out via truck. An empty truck first weighs in, then picks up its load and weighs out. Again, the weighmaster enters the truck ID number and the GMS system records the commodity, weight, trucking company and end use customer. Adams Grain loads and unloads railcars at a concrete elevator across town adjacent to the California Northern Railroad, a short-line connecting to the Union Pacific at Davis, CA. The facility uses an existing bulk weigh scale that operates at 100 to 125 tons per hour. For loading railcars, the operator inputs the railcar number, and GMS system determines the car’s weight limit from its database. (CompuWeigh offers a railcar tag reader for automatically inputting this data but Adams Grain opted not to purchase one.) GMS then directs the bulk weigh scale to load the predetermined weight onto the railcar and generates a weight certificate. This, too, is downloaded into the grain accounting system every five minutes.